Riley James Surveyors has vast experience relating to the undertaking of freelance stock condition and decent home surveys. We provide this service to a variety of clients both locally and nationally. Our main expertise is in bulk surveying for councils and housing associations. We provide tailored inspecting and reporting solutions that meet the specific needs of each client. We also undertake similar surveys for private landlords. Working closely with the client we cater for the varying needs of each contract to deliver a bespoke service. Typically the information collected includes HHSRS, external and/or internal condition assessments, property attribute/archetype information, RDSap assessments, specific element detailing (e.g. windows, doors, kitchens, bathrooms etc. ), measured decoration assessments or any combination of the above. Surveys are produced using electronic tablet technology with supplementary photographic evidence. Collating data in such a way enables the client to be presented with an electronic version of data that can be integrated into their property managment software. 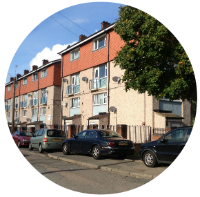 Our surveyors have undertaken 1000’s of Decent Homes Surveys for many different housing associations throughout the UK. As a consequence we believe that the service and expertise we provide is unrivalled. If you would like more information on Stock Condition Surveys & Decent Homes Surveys provided by our Chartered Surveyors then please feel free to contact us.